I go to great lengths to find the oddballs. One of my top priorities while on my trip to Taiwan this summer was tracking down some CPBL cards. The CPBL is Taiwan's major baseball league, though it currently has only four teams. 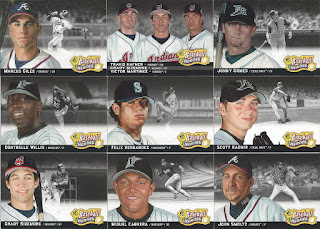 Cards have been produced since 1990 by a couple different manufacturers, and currently are released by the league itself. But supplies dry up fast, and the language barrier really makes card store hunting difficult. I had some free time one afternoon so I checked in with one of the tourist information centers in Taipei and told them what I was looking for. About 15 minutes and a few phone calls later they directed me to go down a random alley. Though I had a decent map I still went past the alley but I didn't get too lost. There was a card store, hidden down a nondescript alley that I certainly never would have been down on purpose. It wasn't scary or anything. It's just one of hundreds "lanes" in Taipei that hold housing and random neighborhood shops. I was so happy to see cardboard, I started browsing cases and making a mental note of what I wanted to buy. Some stuff had prices, while others didn't. I saw some binders sitting on a shelf and started thumbing through them. There's a lot of basketball at this store, and I found some MLB binders. I also found a binder with random sports containing all these Ace Authentic tennis cards. I've made a mental (and written) note that I need to find a complete set of this product. I haven't been keeping up-to-date with my small tennis card collection. Each of these singles cost me about $10 in Taiwanese money, which comes to about 30 cents or 25 yen. Pat Burrell was about $30 (100 yen), and he's numbered to 150! All the cards in the binders were in sleeves with prices, unlike some of the case cards. My scanner butchered this Ripken card image due to the dark background and foil, but it was only TWD$10 as well. 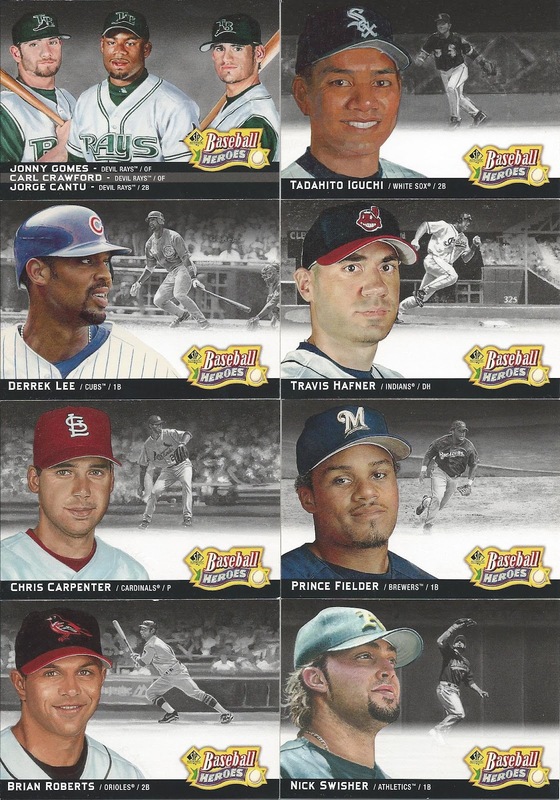 It's a Leaf Gold Stars insert from the mid 2000s. I was really working hard to get a type collection for this Leaf Sportscasters set but I've been kind of lazy lately. Finding this card for under $1 was a nice surprise. There were two Japanese idol cards in the binder for practically nothing. Of course, I bought them. How they ended up in Taiwan I'll never know, but now they're back home. Until I send them off to someone in America. 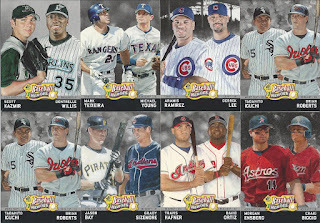 I found a huge mess of these Baseball Heroes inserts from SP Authentic. 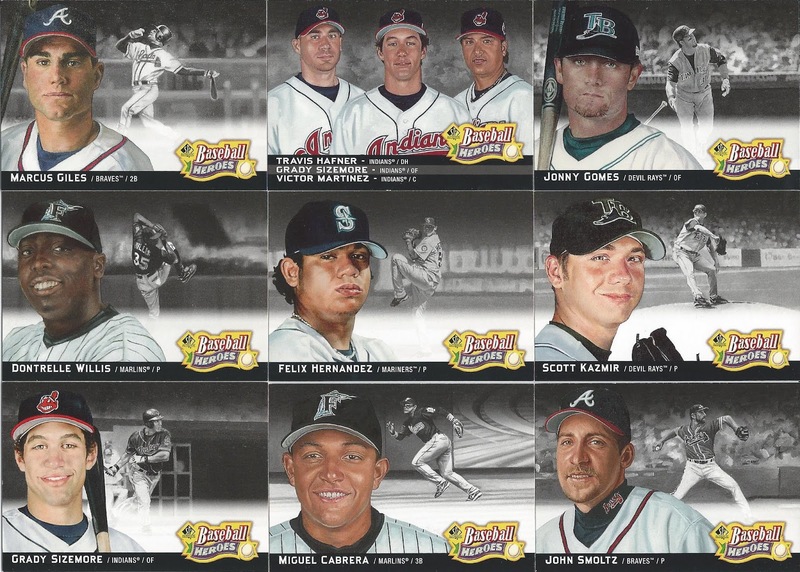 I'm trying to put together a full set of all the Baseball Heroes sets (not counting parallels and autographs) and the inserts from 2006 and 2007 are quite challenging to locate. I could probably find a bunch on Sportlots or COMC but I've been sticking with card shows and stores. I picked up a couple dozen for 10-25 yen each! I didn't need all of them but they were still worth buying. I could have probably spent more time looking through MLB binders, but that wasn't my focus on this trip. I spent only a few minutes pulling all these cards out before I found the binder with CPBL cards. I'll get to the CPBL cards next time. But first, I picked up this little figurine. It doesn't appear to do anything; I'm not sure what the base is for. Maybe it is an ink stamp, but I didn't play with it to find out. As promised, here's the other half of my pickups from Mint Tachikawa, about 30 minutes east of Tokyo. I found these a few months ago, but with my laziness I am just now getting around to posting. This post brings you the oddballs and team issues that most people probably don't even know exist! One thing I found were a bunch of Lions team issues. This store is probably the easiest to get to from the Lions ballpark, and possibly serves a good fan base for the team. The back has a nice collection of statistics and highlights. I'm not sure why this is labeled as a "special" card other than there was probably some other release as well. This is from 2008, obviously. This card was released in 2011 and has a nice horizontal design. It's probably a more "regular" team issue release, and has an attractive back design with a large photo and statistics. These scans aren't in order! This is from 2009, and again is a Lions team issue. The back of this card uses a QR code for some special offer. There are less lines of statistics (just the prior year and career data). When I saw this card I thought it was another late-90s BBM issue. The lack of BBM copyrights and its location mixed in with other Lions team issues tells me it was a team issue. I'm calling this the back of the card, though it could just as well be the front. This is another "Special Card" from 2009 issued by the Lions. The back of this one contains a good bit of data on Watanabe's managerial career. 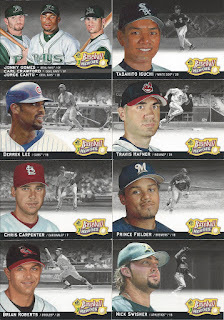 Here is another card from the 2011 set, with a little different front design. The back is identical, though. And a 2011 vertical layout. The Lions issued this "Special Card" in 2010. The backs are similar to prior years' releases. After all those team issue cards, I also found a couple oddball-ish releases. This is a sticker issued by Lotte and included with some sweets (chocolate wafers, most likely) in 2008. There were a few years of stickers similar to these, with a couple different sets issued each year. This is the gold set, which is a gold foil sticker with a cartoonish line art. The back design can vary (in some years) but this one has a facsimile autograph. They all have blue backgrounds. Here's an interesting find. This card has a nice photo on the front with a facsimile signature in the upper corner. The first odd thing about this card is that it is basically laminated. It has a clear plastic border, which you can see in the scans above and below. Two other odd things about the card are the inclusion of a giant barcode on the back and a hologram sticker over the top. It appears to have been issued in 2000. My last pickup to show from the Tachikawa store is this postcard apparently issued by the Fukuoka Daiei Hawks to commemorate three Pacific League pennant wins as the Daiei Hawks. If that is the case, it would have been issued in late 2003 or more likely in 2004, as the team became the Fukuoka SoftBank Hawks in January 2005. I was quite pleased with my haul from Tachikawa, and as I mentioned in my last post, I plan to return in November when I head in that direction. I should note that while the random value-like box was fun to poke through, I don't remember there being a very good selection of cards for people looking for specific set-building before the past year or so of cards. When I go back I'll be sure to pay better attention to this. Just know that this card store is a good bit out of the way and for short-time visitors it might not be worth the trip. I'm about ready to start posting my Taiwan card finds. But first, a two-part post on Mint Tachikawa, a small mall card store located on the east side of Tokyo. This post will mostly focus on normal issues, while the second part will show the mother load of oddballs. Here is a BBM team set card. This year's Giants set had a nice simple design. It's a bit oddball, but not too crazy: a gaming card using WBC players. This might have been the only card from the set in the cheap box I looked through. It's a Sportsflix card! Kind of. BBM issued this a long time ago (relatively). 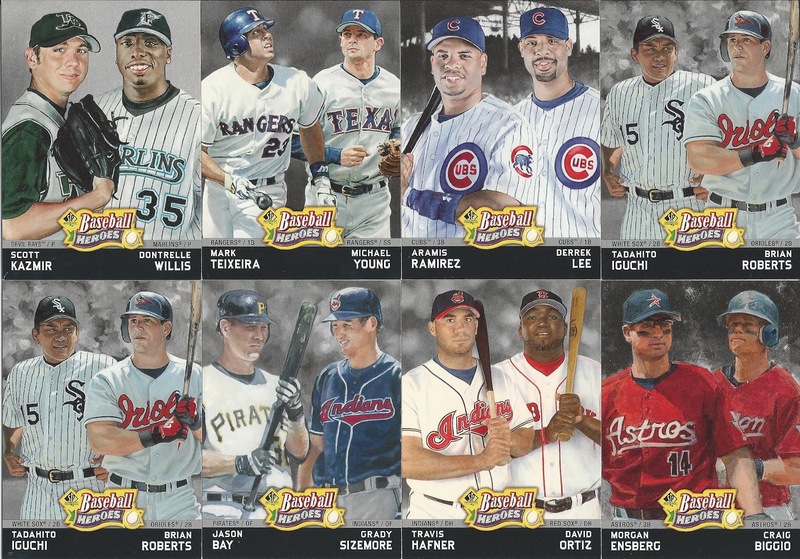 The design reminds me of Fleer releases, especially the back. Fighters foil. I spent a long time looking through a box of 30 or 50 yen cards (I don't remember exactly - most likely the latter). This is a nice BBM insert I found pretty cheap. I didn't expect to find a nice insert as cheap as this was. Promotion. As in, promo card. I've been noticing these more and more lately. Actually, the recently-released Genesis set seems to have promos for every insert set (at a different Mint location), but they are priced pretty high. BBM's Touch The Game was the major relic/high end release until this year, when Genesis replaced it. Usually the base cards also carry premium prices. A foil card. Note the blue glove. Hm. Didn't we see this card set already? This is a Prime Nine gaming card. The back, like a deck of cards, contains a generic set logo. Not a foil parallel! Yet, another premium card at a good price. And this thing. Lions 9, an insert set. Here's the back. It's part of the 2003 Lions team set issued by BBM. Mint Tachikawa is located in Tachikawa, two blocks north of Tachikawa Station. It's about a thirty minute ride from Shinjuku by direct train, located in a mall that appears to be called "prom" on the fourth floor. Being so far away it is probably not worth traveling to unless you're already headed that way. If you do go, be sure to look for the box of random cards that seem to be cheap or discounted... if they're still there. I went there a few months ago, but I hope to make a return trip sometime in November. Meanwhile, the better half of my find will come in my next post! Korean Baseball: What Do You Know?